Amid ongoing uncertainty over his current contract situation, Man Utd goalkeeper David De Gea has seemingly dismissed any concerns over his future at Old Trafford. As noted by the Metro, it has been suggested that there are still issues over getting the Spanish international to commit his long-term future to the club. 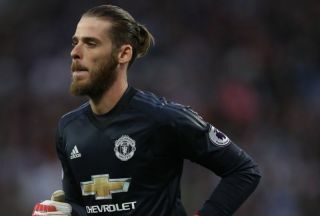 However, speaking ahead of his side’s clash with Young Boys in their Champions League opener on Wednesday night, De Gea moved to dismiss any notion that he may be considering an exit from Manchester when asked about his potential new contract. “I feel real love for this club, the fans. I’m really happy. It’s one of the best clubs in the world so it’s really good to be part of this club,” he told the media, as per the Manchester Evening News. The 27-year-old has undoubtedly established himself as one of the top goalkeepers in Europe, constantly producing key saves to help his side secure positive results. He did so again at the weekend with a crucial late stop against Watford to help seal a 2-1 win, and so there’s no doubt over his ongoing importance to Jose Mourinho and the Red Devils. In turn, they’ll hope to wrap up the situation as soon as possible and see him put pen to paper on a long-term agreement, but time will tell when that moment arrives. For now though, United fans will surely be delighted to hear his statement above about being happy at the club, and that should be enough to suggest that he has no intention of going elsewhere and it’s merely a case of negotiations taking their course until a new deal is secured.